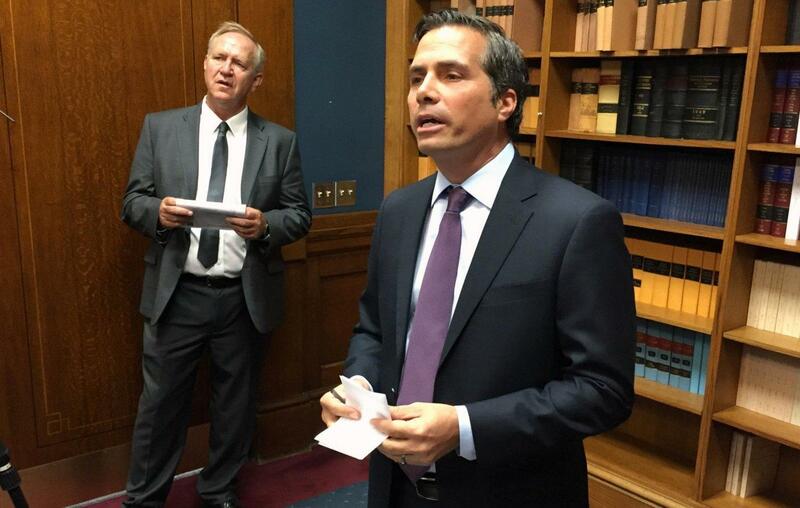 Greg Orman, an independent candidate for governor, with running mate state Sen. John Doll. Gov. Jeff Colyer lost a nail-biter Republican primary for governor to Secretary of Kris Kobach and quickly backed the man who beat him. At least one key member of his campaign, however, moved on Monday to jump ship from the party’s nominee. Colyer campaign chairman and longtime former Kansas Farm Bureau president Steve Baccus threw his support to independent candidate Greg Orman. Baccus’ move marks a public defection from Colyer’s efforts to rally party regulars behind Kobach, and it’s a strategy to bring Colyer supporters to the Orman campaign. Baccus cited Orman’s business experience and the agricultural roots of his running mate, state Sen. John Doll. Orman said he’s hoping to build a wide coalition, and he’s working to attract Republicans who are put off by what he calls Kobach’s “extreme” policies. Baccus and Orman were campaigning Monday after the announcement. Baccus said his decision was driven by policies, not Kobach’s style. The Kansas Farm Bureau endorsed Colyer in the primary but has not yet backed anyone in the general election. Colyer came out in support of Kobach after the primary and he doubled down on that Monday. "While Steve can certainly campaign for whoever he likes,” Colyer said in a statement, “I have made my support for Republican candidate Kris Kobach very clear and encourage all Republicans to rally around our nominee." Kobach characterized the endorsement as political insiders sticking together. Democratic state Sen. Laura Kelly rounds out the high-profile candidates in the race for Kansas governor. Stephen Koranda is Statehouse reporter for Kansas Public Radio, a partner in the Kansas News Service. Follow him on Twitter @kprkoranda.